As days passed manam chala cinemalu chusthu vachham and సాంకేతిక విజ్ఞానం kuda ekkadinuncho ekkadiko vachhindi. Nenu school lo chaduvukunna rojullo computer ante oka adbutha srusti, taruvatha melliga computer(Work Station) nundi wireless laptops taruvatha ee tablets and smart phones. Cinemalu kuda anthe, appatlo black and white cinemalu nundi mellimelliga color cinemalu vachhayi. Vatiki konni rangulu touch chesi dhaniki Visual effects ani peru pettamu. Aa taruvatha sound effects ani, DTS cinema ani cinema basha matladukunnam. After DTS (Digital Theater Systems) we saw the change in cinema through IMAX and now we are talking the concept of Dolby Cinema. Inni jarigaka manishi ee latest technology ki alavatu padi patha cinemala gurnich alochinchadam manesadu. Earlier, ante 60 years venakki velithe cinema ante oka kutumba story, pauranika chitralu, anubandala harivallu. Taruvatha kalatmika sandeshatmika, Social-elements chitralu. Atu nundi Ram gopal Varma teesina shiva taruvatha cinema trend maripoyinidi . 2000 ki vachhesariki telugu cinema faction stories ki alavatu paddayi taruvatha edo regular template commercial cinemalu vacchayi (But there are still some directors who are mavericks in making their style of cinema). Ippudu mana vallu marutunna technology ki new independent wave ki vachharu (Which is a great move by the Telugu Cinema viewers encouraging the new wave). Inni jarugutunna tarunam lo sudden ga Darshakudu Sukumar Ram Charan and Samatha toh cinema ane telisisariki ee sari Sukumar ela teesthado ani edo alochanalu. Cinema peru Rangasthalam ani chadivaka ..Wow assalu aa title endi Rangasthalam …Abdutham and cinema 1985 lo jarige sanniveshalu ante ooho malli aa patha madura ooru gnapakalu, appatlo ooru ela untundo, appati manushula looks and havabhavalu ivanni ela untayi cinemalo ani malli oka kind of teliyani curiosity. Teaser toh Sukumar expectations penchadu. Taruvatha ఒక్కొక song vidudhala chesaru. Cinema loni songs village nativity ki connect ayetattu aa yenki patalu, saralamaina telugu basha sahitya saragalu and melodious sangeetham from DSP … Abbabha assalu enni sarlu vinano nenu patalu. రంగస్థలం అనేది ఒక ఊరు. ఏ మాటకి ఆ మాట చెప్పుకోవాలి కానీ అస్సలు ఊరు ఎంత బాగుంటది అండి. ఊరిలో లలిత కళల ఎక్కువనే ఉండేవి. పండుగలు , పర్వాలు ఇంట్లో అనుబంధాల వేడుకలు. నాటకాలు , జానపద గీతాలు అబ్బో ఎన్ని ఎన్ని ఉండేవి. మరి ముఖ్యంగా ఊర్లో జాతర్లు ఒక సందడి వాతావరణం. బాధ కలిగించే విషయం ఏమిటి అంటే ఇప్పుడు ఆ జానపదాలు ఎక్కడివి?నాటకాలు ఎక్కడివి?అప్పట్లో పండుగలు చేసుకునేటట్టు ఇప్పుడు జరుపుకుంటున్నామా? ఎదో మన ఊర్లో దేవుళ్ళు ఉన్నారు కాబట్టి , అన్ని భారాలు ఆయనకి ఇచ్చేసి మనం వాళ్ళని భుజాన వేసుకొని ఉరేగింపులతొ జాతర్లు జరుపుకుంటున్నాం. అయన ఉన్నాడు అని మనం గట్టిగ నమ్ముతాం కాదండి! అదండీ విషయం ..లేకుంటే జాతర్లు కూడా కరువయ్యేవి. అబ్బా ఎం చెప్పమంటారు లెండి ఊరు అంటే. అదండీ విషయం. కొందరు మనుషులు మంచోళ్ళు కాదు కదండీ? లేకుంటే పచ్చగా ఉండే ఊర్లో కష్టాలు, కన్నీళ్లు ,బాధలు ఎందుకు పుట్టుక వస్తాయి? మనలో మన మాట , ఊర్లోనే కాదు కానీ ఈ మనుషుల వల్ల cities ఇంకో ఒక ఎత్తుకు వెళితే country , ఇంకా చెప్పాలి అంటే అస్సలు ప్రపంచం బాగు పడట్లేదు. ఎక్కడ చుసిన గొడవలు, స్వార్ధ రాజకీయాలు. ఇంకా ఎక్కడ అండి బ్రతుకేది? Cinemalo mana kathanayakudu Ram Charam peru chitti babu , partially impaired anduke oorlo andaru mudduga Sound engineer ani pilustharu(meeku teluse untundi lendi trailer lo chusesinattu unnaru). Oorilo panchayati vyavaharalu mamolga undavu kadhandi ..rajakeeyale simple ga cheppalante this is revenge story well-crafted by the Director Sukumar with brilliance in movie making. Cinematography from Rathnavelu is scenic to the eyes to capture the landscape beauty of the village. What went in his mind when Ram Charan performed the character as Chittibabu? Abba ee question chala common ga anipistundi kadhandi? Mr.Charan assalu ela chesav babu aa character? Dude you were so involved in the character. To be precise immaculate performance from Charan. This is Ram Charan’s the best till date. 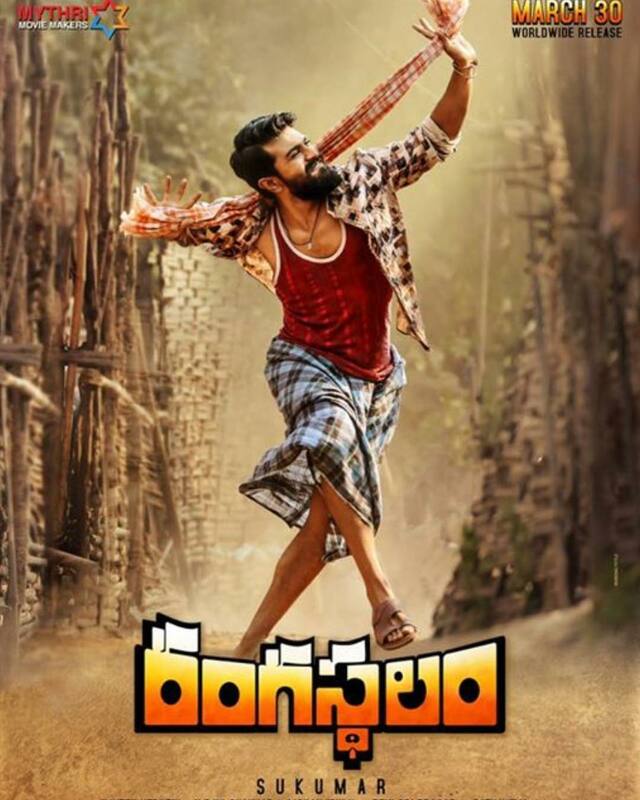 Ram Charan look, full beard toh completely different ga unnadu and so Samatha as never before as a Village girl. Samantha as Ramalakshmi is magnificent. The sweet talk between Ram Charan and Samantha is like chalam sahityam talking to Krishna Shastri Sahityam. Aadi Pinishetty as Kumar Babu Brother of chitti babu gave the shine to the character. The loving brother duo are friendly and emotions are high. Anasuya as Rangamathha shined in a memorable performance in her career. There are few scenes where I yelled and shouted because the acting from Ram charan brought the whistles and tears from audience. Though it’s almost 3 hour long movie, I didn’t felt bored anywhere because of gripping screenplay from Sukumar. I felt the exuberance act from Ram Charan, riveting film from Sukumar reflected me clap more after the film specially Ram Charan Tej. But movie chuddam anukuntunna..bcoz Naku movie style chuste karthi Subramaniapuram la anchindi...LastL enti ante nu rasindi enjoy aithe chesta.. Excellent review. I really experienced my childhood memories with you description of village. Your reviews are great and you will be a great reviewer, you have a great grip on telugu language. All the best. Keep going.